The Internet architecture is a packet switching technology that allows dynamic sharing of bandwidth among different flows with in an IP network. Packets are stored and forwarded from one node to the next until reaching their destination. Major issues in this integration are congestion control and how to meet different quality of service requirements associated with various services. In other words streaming media quality degrades with increased packet delay and jitter caused by network congestion. To mitigate the impact of network congestion, various techniques have been used to improve multimedia quality and one of those techniques is Active Queue Management (AQM). Access routers require a buffer to hold packets during times of congestion. A large buffer can absorb the bursty arrivals, and this tends to increase the link utilizations but results in higher queuing delays. Traffic burstiness has a considerable negative impact on network performance. AQM is now considered an effective congestion control mechanism for enhancing transport protocol performance over wireless links. In order to have good link utilization, it is necessary for queues to adapt to varying traffic loads. This paper considers a particular scheme which is called Adaptive AQM (AAQM) and studies its performance in the presence of feedback delays and its ability to maintain a small queue length as well as its robustness in the presence of traffic burstiness. The paper also presents a method based on the well-known Markov Modulated Poisson Process (MPP) to capture traffic burstiness and buffer occupancy. To demonstrate the generality of the presented method, an analytic model is described and verified by extensive simulations of different adaptive AQM algorithms. The analysis and simulations show that AAQM outperforms the other AQMs with respect to responsiveness and robustness. Proposals to handle differentiated and guaranteed services in the Internet have not provided the expected benefits for both users and operators. Its complexity, with a large number of interconnected networks, is difficult to handle in an efficient way. This is due to the resource heterogeneity in terms of technologies and the inconsistent implementation of quality of services (QoS) in different networks. A Next Generation Network is an advanced, packet-based network that exploits multiple broadband QoS enabling transport technologies to provide communication services. The objective of Next Generation Network is to focus on users and those service-related functions that are independent of underlying transport-related technologies. With the advent of Next Generation Network, services that are currently provided by multiple specific network-centric architectures are migrated toward a single, converged, user-centric communication network. A satisfactory level of QoS particularly with respect to wireless links is highly dependent on traffic control strategies. The IP has traditionally been successfully used with best effort services. However, with the emerging multimedia communication, using IP as the network protocol traffic differentiation is required when using different QoS classes. This is particularly the case in order that real-time traffic can be given a higher precedence over nonreal time traffic. It is highly probable that the problem will be exacerbated by the fact that, in general, the various wireless infrastructures adopt different mechanisms in order to achieve QoS. The phenomenon of congestion is clearly one of the detrimental factors to the QoS as congestion has a negative influence on the delay (and hence the appearance of jitter), and also on the reliability. During the past number of years, there have been a variety of mechanisms developed to deal with congestion both in end hosts and at the network level (router based) [1–3]. However, in heterogeneous networks the assumption that a packet loss always indicates an appearance of congestion might be flawed. This is simply because (1) a wireless link has a much higher bit-error rate and (2) the Internet connection might be temporarily down due to handover. This may result in an unnecessary invocation of some congestion recovery algorithms and this will have an immediate effect on network performance such as a low link utilization and unsatisfactory transport protocol performance. Consequently, there has been a certain reluctance to deploy end-to-end congestion control mechanisms for networked multimedia applications in transport protocols. Access routers require a buffer to hold packets during times of congestion. A large buffer can absorb the bursty arrivals of more packets but this tends to increase response times. The approach most utilized in relation to buffering is to set a maximum limit on the amount of data that can be buffered. The buffer accepts arriving packets until the queue is exhausted and then drops all subsequent arriving packets until some space becomes available in the queue. With recent advances [4–6], it is now possible to perform an all-optical switching method regarding the opening the door to routers with a huge capacity and lower power than that for electronic routers. Recent advances in technology make it possible to use optical First Come First serve (FCFS) packet buffers that can hold a few dozen packet in an integrated optoelectronic chip . Figure 1 shown an optoelectronic router architecture. Larger all-optical buffers remain infeasible, except with unwieldy spools of optical fibers and that can only implement delay lines, not true for FCFS packet buffers. In  one of point discussed as requirements for future Internet or post-Internet architecture is high-speed network to exploring the feasibility for an operational all-optical network with just a few dozen optical packet buffers in each router. If big electronic routers required only a few dozen packet buffers, it could reduce their complexity making them easier to build and easier to scale. A typical 10 Gbps router line-card today contains about one million packet buffers, using many external DRAM chips. The board space occupied by the DRAMs the pins they require and the power they dissipate all limit the capacity of the router . In switch plane behavior of the optoelectronic router, if an output port is available for forwarding, then packets will be forwarded. Otherwise packets will be held in shared buffer until there is an available port. Packets leave the shared buffer only when both the destination port and the shared buffer output port are both available. 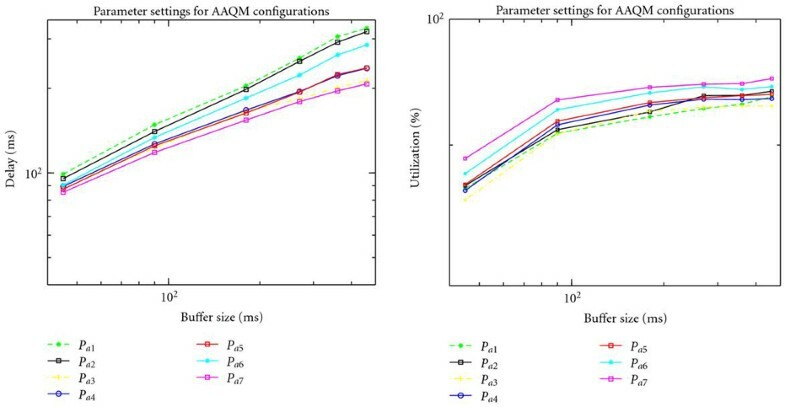 Increasing the number of inputs to the shared buffer will significantly improve switch plan performance, in this end there is a need for potential buffer management for congestion control such as AQM. AQM intends to achieve high link utilization without introducing an excessive delay into the E2E path. In order to achieve good link utilization it is necessary for the AQM to adapt to varying traffic loads. AQM has been subject to extensive research in the Internet community over the past few years and a number of methods to control the queue size have been proposed [3, 9]. An increase in Round Trip Time (RTT) not only degrades the control performance of an AQM algorithm, but also leads to instability in the network. The studies on AQM in [3, 9–12] only evaluated the system throughput performance a situation not directly related to the performance metrics studied in this paper. Publications that are more closely related include a different model which use the Markov Modulated Poisson Process (MMPP) to capture the buffer occupancy with a special case of the model studied in this paper. The main result is that minor modifications to closed loop traffic would indeed allow the reduction of buffer sizes to dozens of packets with the expense of slightly reduced link utilization. From the above discussion it is clear that a large buffer size absorbs a great number of bursty arrivals of packets in the access router and that an MMPP-8 can be used for the exact analysis of the buffer occupancy model with both open loop traffic and closed loop traffic taken into consideration. In addition, the effects of coexistence of such traffics in buffering occupancy are very limited and this provides the main motivation associated with the research in this paper. Specifically, this paper targets the question how to minimize buffering with a smaller buffer size and with only a few dozen packet buffers in each router at the expense of high link utilization. We propose a method based on the well-known MMPP to capture traffic burstiness and buffer occupancy. And we have developed a queuing system with an MMPP-8 arrival process for evaluating the performance of an adaptive AQM-based congestion control mechanism using various loss probabilities as the marking/dropping function. The use of this marking/dropping function designed for a small buffer size is intended to avoid traffic burstiness. The rest of this paper is organized as follows: Section 2 describes related work; Section 3 presents the adaptive algorithms used in the study; Section 4 presents the AAQM concept; Section 5 presents an analytical model; Section 6 presents the simulation model; Section 7 presents the performance analysis. Section 8 compares AAQM to a hybrid AQM approaches which have been known as BLUE. Finally Section 9 presents conclusions and future work. The work presented in  studies the effects of unresponsive flows on AQM. It shows that the queue averaging time is the result of a trade-off between AQM responsiveness and the robustness of the uncontrolled flows. The average queue time results in a smooth or stable congestion feedback that introduces jitter in the queuing delay due to variation in the unresponsive flows. Three flow types were considered: short-lived TCP, Markov on-off UDP, and traffic with long-range dependencies (e.g., ftp). The work in this paper instead focuses on video, multimedia, long-lived and short-lived flows and uses a more realistic model for video traffic and VoIP traffic by using RTP and UDP traffics. 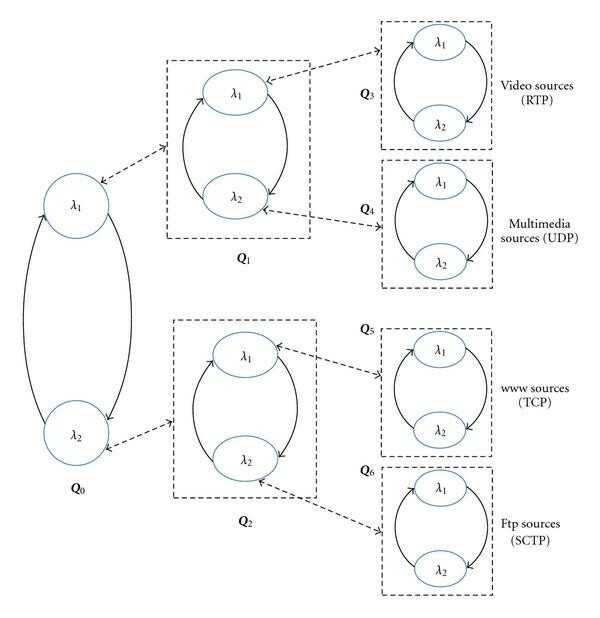 Also  does not study the impact of video traffic flows and unresponsive flows on the AQMs algorithms, while this is the case in this paper where the main focus is on burstry traffics and unresponsiveness UDP flows with coexistence TCP flows, RTP flows and SCTP flows. The study in , surveys two adaptive and proactive AQM algorithms using a classical proportional-integral-derivative feedback control in order to achieve stability and responsiveness. The TCP flows are modeled as long-lived FTP flows. In our work the flows are modeled as the mix of long-live flows and short-live flows to fulfill the design goal of an adaptive AQM which interacts with realistic flow compositions. In  the authors argue in favor of a rate-based AQM for high-speed links. Also in this work a proportional-integral controller for the AQM scheme is used. The design goal was to match the aggregate rate of TCP flows to the available capacity while minimizing the queue size. The work presented in  uses a token-bucket model as a virtual queue (VQ) with a link capacity less than the actual link capacity. If a packet arrives, it is placed in a queue in the VQ if there is space available. Otherwise the packet is dropped. Accordingly the algorithm is able to react at an earlier stage, even before the queue grows, making it very sensitive to the traffic load and round trip time. However, the utility functions are much different from ours due to the AQM control parameters. The AAQM uses control law and link utilization in order to manage congestion. The action of the control law in AAQM is to mark incoming packets in order to maintain the quotient between arriving and departing packet at as low value as possible. The study in  focused only on the RED and the parameter setting of RED was based on heuristics. Also  studied RED against a disturbance in the wireless access network. Only one type of flow was considered: short-lived TCP. The paper studied RTP, UPD, TCP and SCTP in coexistence and their impact on ARED, PI, VQ and AAQM. The work presented in  used a proxy AQM between the access point for WLAN and the wired network. The proxy reduces the overhead of the access point by implementing AQM functionality at the gateway. In this work the authors extend the RED/ARED scheme to a proxy mode by calculating the average queue length and updated values of for ARED. They measured only a number of TCP flows. In  a channel-aware AQM scheme was presented. This new approach provides congestion signals for flow control based not only on the queue length but also on the channel condition and the transmission bit rate. For the performance evaluation of the new AQM in multirate WLAN, the bit rate of the wireless node is set manually and fixed at different levels (in sequence of 2 M, 1 M, 11 M, and 5.5 Mbps). Two TCP flows were considered. The main idea in this work was to design an AQM for flow control in multirate WLAN. The AQM algorithms Adaptive Random Early Detection (ARED) , Adaptive Virtual Queue (AVQ) , Proportional-integral (PI)  and Adaptive AQM (AAQM)  are compared in this study. Random Early Detection (RED) is widely deployed and there are several variants working in slightly different ways. RED makes a decision by calculating the average queue size and by applying a low-pass filter with an exponential and weighted moving average (using the history of the queue to decide whether or not to mark a packet). The average queue size is compared to the minimum and maximum thresholds. When the average queue length is less than the minimum threshold no packets are dropped. When the average queue length is above the maximum threshold then all arriving packets are dropped. If the average queue length is between the minimum and maximum thresholds, then RED bases its decision regarding whether or not to drop a packet-based on the average queue size. As the average queue size varies from the minimum to the maximum threshold, the packet drop probability increases linearly. The ARED  algorithm attempts to maintain suitable operating parameters in RED by dynamically adjusting based on observing the queue length dynamics. ARED increase the when the average exceeds the maximum threshold and decreases the when the average falls blew the minimum threshold. AVQ uses a modified token bucket model as a virtual queue to regulate the buffer utilization rather than the queue length. AVQ adjusts the size and link capacity of the virtual queue proportional to the measured input rate and drops packets when the virtual queue overflows. AVQ maintains a virtual queue whose link capacity of a link is less than the actually capacity of a link and whose buffer size is the same as the buffer size of the real queue. At each packet arrival the virtual queue is updated according to a different equation , where is the packet arrival rate, is a desired link utilization and is a damping factor. If the new packet causes an overflow in the virtual queue then the packet is dropped in the virtual queue and the real packet is dropped in the real queue. PI stabilizes the router queue length around a reference queue that can be achieved by means of I-control. While an improvement to the responsiveness can be achieved by means of proportional ( )-control using the instantaneous queue length . The resulting PI-controller is though to be capable of eliminating the steady-state error regardless of the load level. AAQM is an algorithm that aims to maintain the packet arrival rate as close to the packet departure rate as possible. AAQM is presented in Section 4. AAQM is a light weight algorithm aimed at maximizing the flow of packets through the access router, by using an optimization-based mechanism. The idea in such a mechanism is to find the optimal value of the queue occupation by considering two metrics for instance the minimization of the queuing delay and the maximization of the throughput. The AAQM algorithm is a feedback control function which adjusts the rate of congestion notification in response to the flow-based congestion measure which estimated the packets arrival rate. The key idea behind AAQM is to perform congestion notification at a rate which maintains the aggregate transmission rates of the sources at or just below the clearing rate. As a matter of fact it is possible for AAQM to notify congestion by either discarding packets or by marking packets using the Explicit Congestion Notification (ECN) . Contrary to the conventional control approaches these focus on constructing a controller by using the model of the rate-based system. The algorithm is able to update the drop/mark probability according to the packet arrival rate. Using this metric is beneficial and permits the maintenance of a low queue occupation. In the following section we present the design of the AAQM controller. During the period involved in the design of this controller three events were adopted which occur during the execution of the AAQM algorithm. A key issue in the design of the AAQM is the choice of the speed of adaptation of the queue occupation. The speed of adaptation is determined by three events. AAQM utilizes the packet arrival event when a packet arriving at one of access router incoming interfaces is supposed to be transmitted to the outgoing interface, as shown in Figure 2. and are the current queue length and maximum queue length, respectively. is updated every time a packet is added to the queue or removed from the queue. Depending on the size of , the packet will be enqueued or discarded. If the packet is enqueued then the outcome of a random variable RND in conjunction with the packet marking probability determines whether or not the packet is marked (detecting an onset of congestion). The packet marking either means that the congestion experienced bit, which is part of ECN , is set in the packet header or that the packet is discarded. Then , which is the number of packets arriving in the queue during the course of the last time interval, is increased by one. Figure 3 shows the packet departure events. The event occurs when a packet is enqueued at the outgoing access router interfaces and it is transmitted over the outgoing link. Then , which is the number of departures packets from the queue occurring during the last time interval, is increased by one. In the steady-state the departure process can be decomposed into two different situations after the departure of a packet: (a) the departing packet sees an empty system or (b) the departing packet sees the next packet in the queue (which is equivalent to the system which immediately servers the next packet in the queue). The speed of adaptation is determined by step size parameters which are denoted by and as shown in Figure 4. The timer event occurs at fixed, evenly spaced, time intervals. The time that elapses between two timer events is determined by the parameter measured in seconds. and are the number of packet arrivals and packet departures to and from the queue during the last time interval. is the utilization factor of the queue. Special care has to be taken when computing since a timer event could be triggered after a packet has arrived at the queue but before it has been sent. To avoid placing the algorithm in an illegal state the following rules apply: if then ; however, if both and then and there is no load in the system. is the packet dropping probability. and are the sizes of the adjustments for the packet dropping probability depending on whether or . must never be smaller than 0 or greater than 1. At the end of a timer event and are set to 0 so that the utilization factor for the next time interval can be computed. In this section we look at the adaptation behavior of the AAQM by studying the sensitivity of the AAQM to the smoothing and utilization parameters , , and . The simulation setup is identical to that in Section 6. In the first part of the experiment the smoothing is varied from 0.010 to 0.090 while the utilization parameters are fixed at and . We observe that the average queue length remain smaller respective of the value of being used. However, the transients due to the sudden load of the unresponsiveness (UDP) flows at 175 s simulation are more pronounced when is small. In the second part of the experiment we fixed the value of to be equal to 0.010 and varied the value of and as shown in Table 1 in order to study the sensitivity of the AAQM. Figure 5 shows the evolution of the utilization parameters and for different values of buffer size. We can see that at the value of this results in a lower queuing delay and a higher utilization. The parameter settings for the five different AAQM configurations. The parameter settings for AAQM configuration for performance metrics (a) delay (b) utilization. As a result of the study regarding the tuning of the AAQM for use in heterogeneous networks we observe that a large will give a larger time interval over which the quotient is computed. This will in turn lead to a better prediction with regards to the flow through the queue. But on the downside it will also lead to a slower reaction to changes in the flow. Slow reactions to changes in the flow can lead to high delay and packet loss. Using clearly indicated traffic burstiness over heterogeneous networks and corrections of such traffic several stochastic models have been presented to capture traffic properties of this type. For instance the well-known Markov-Modulated Poisson Process (MMPP)  has been used to model the time-varying arrival rate and to capture the important correlation between interarrival times while still maintaining analytical tractability . On the other hand, in heterogeneous networks with heavy traffic, various sources requesting different QoS compete for bandwidth and buffer space while being unaware of the current state of the system resources. This situation can easily lead to congestion even when the demand for available resources is not exceeded . Consequently, system performance degrades due to the increase in packet loss. In this context, congestion control mechanisms play important roles in effective network resource management. 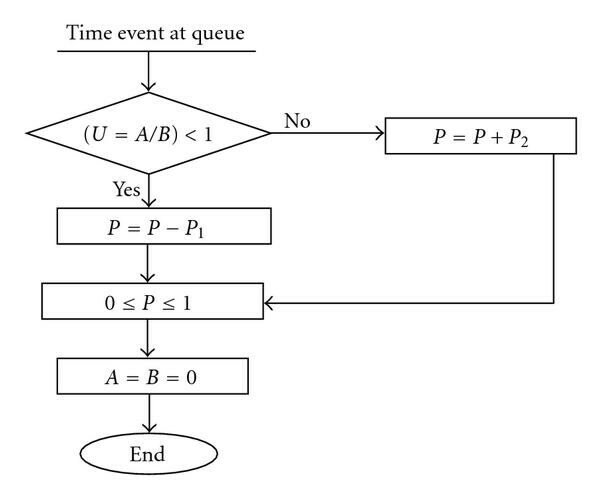 This study aims to develop a queuing system with an MMPP arrival process for evaluating the performance of an AQM-based congestion control mechanism by using various loss probabilities as the Marking/dropping function. The Marking/dropping function is presented briefly in Section 5.3 in this section. The model for the superposed traffic of video, multimedia, web and ftp sources is analyzed in this paper by constructing an (MMPP-8)/Er( )/1/L queue. The results given in  used to carry out this analysis. An MMPP-8 which is shown in Figure 6 has eight parameters: four parameters denoting state transition rates another four showing the arrival rates. The MMPP-8 is a superposition of two MMPP-4 processes. In the first one, is for video sources and is for multimedia sources and for the second one is for www sources and is for ftp sources. The service time is approximated by an -stage Erlang distribution service time (Erlang distribution is an appropriate candidate for representing the true situation with regard to service times and interarrival times ). The buffer size is represented by L. In order to model the multimedia sources, and Markov model ON-OFF minisources is used as shown in Figure 7 to represent a multimedia source. It is assumed that the multimedia packets arrived during the ON state and that there is no arrival during the OFF state. The independent multimedia sources are modeled by an MMPP-4 equivalent to the superposition of the minisources ( ). MMPP-8 consisting of three levels. Markov model for a minisource. where and represents the transition and arrival rate matrix, respectively. where , , and represent a Kronecker sum, Kronecker product and an identity matrix. The steady-state probability of MMPP-8/Er( )/1/L can then be computed by extending the results in . The size of the infinitesimal generator matrix is . The steady-state probability of the system can be obtained from the performance parameters such as the average number of packets in the system, so that drop probability and packet delay can be easily estimated. The packets-loss probability of the aggregated video sources, multimedia source, www source and ftp sources used as the threshold to control the external traffic arriving into the queue is shown in Figure 7. When the queuing length exceeds the threshold then the arriving packets will be marked or dropped. This process can be seen as a reduction of the arrival rate with the loss probability. 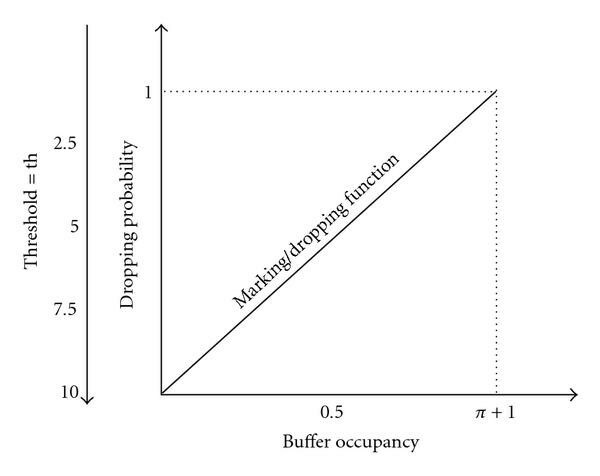 where is the probability of buffer occupancy for each of the traffic sources from (7)–(10). The value of the threshold (th) will be changed from the packet-loss probability of traffic sources by means of (13)–(16). 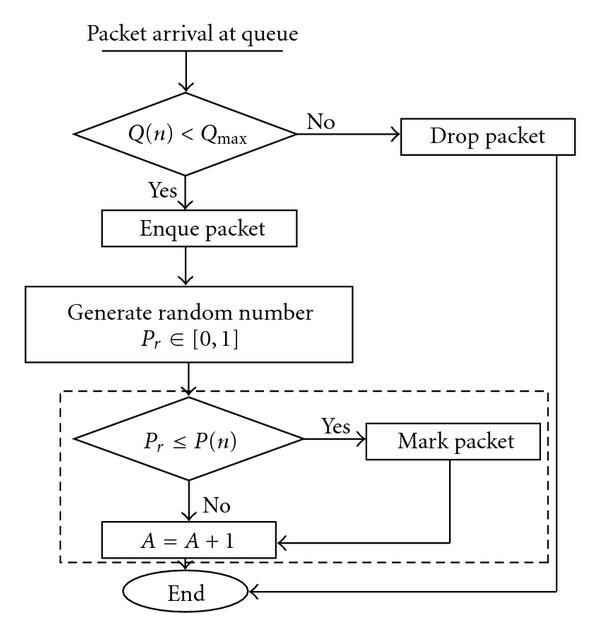 The loss probability is used for marking/dropping packets and the position of the threshold for each of the traffic sources under the MMPP-2 arrival process, as can be seen in Figure 7. The marking/dropping control function is adopted mainly in the AQM by using the output values for the parameters setting of each AQM and this has been shown in Table 2. The marking/dropping probability increases linearly between 0 and 1.
lists of control parameters for each AQM. A state transition diagram for the queuing model regard in each of the traffic sources under the MMPP-2 arrival process is shown in Figure 8. Two different states of the MMP-2 corresponds to two independent Poisson arrival processes with rate and . and are the intensities of the transition between the two states. The state with , which represents the current queuing length is and the traffic arrival process MMPP-2 is at state . The buffer capacity is given as and is the service rate. State transition diagramfor each traffic sources under the MMPP-2 arrival process. The theorem (in Section 5) shows that by choosing parameters settings according to (18) it is possible to guarantee the local stability and responsiveness of the AQM schemes. The simulation results presented have been obtained by using the NS-2 simulation tool . Figure 9 shows the topology used. We investigate the performance and robustness of the AAQM and compare it to that of ARED, PI and Vq. The dynamic behavior of the AAQM, ARED, PI and Vq schemes is simulated under a variety of network topologies and traffic sources. There is a bottleneck between Node 0 and Node 1. The link capacity of the bottleneck is 10 Mb/s. The topology consists of a wireless heterogeneous network employing three wireless access networks UMTS, WiFi and WiMax. The source traffic is generated by using TCP, UDP, RTP and SCTP and the traffic sources are connected by 100 Mbps links with Node 0. Node 1 is connected by means of UMTS, WiFi and WiMax base stations through 100 Mbs links. There are three traffic groups. Each group consists of four wired connections. This topology is designed to capture the essential characteristics of the heterogeneous network traffic using the four transport protocols for the connection between the wired and wireless nodes. Network topology for performance evaluation. The link between the nodes 0 and 1 represents the virtual bottleneck link when running the AQM algorithms. The virtual bottleneck represents an access router. 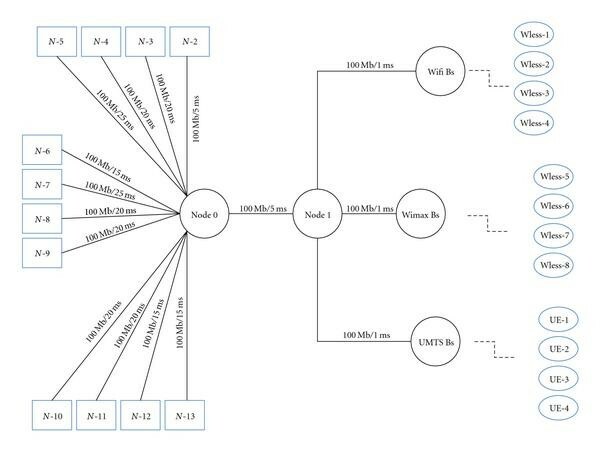 Data originating at the nodes 2–5 are received by the nodes Wless-1 to Wless-4 (through the WiFi base station) and data originating at nodes 6–9 are received by the nodes Wless-5 to Wless-8 (through the WiMax base station) and data originating at the nodes 10–13 are received by the nodes (User Equipment) UE-1 to UE-4 (through the UMTS base station). The source of the RTP uses an MPEG-4 binary trace file  as its input trace file. The RTP agent sends data from the MPEG-4 binary trace file and the receiver is a RTCP agent that sends a report concerning the connection (packets-loss, RTT) so that the RTP agent can adapt his rate and the RTCP sends a report every 900 ms. The UDP flows are based on an Exponential On/Off distribution traffic generator with a bursty time of 800 ms and an idle time of 200 ms. The TCP flow uses a Pareto traffic generator (to generate aggregate traffic that exhibits a long-range dependency). The SCTP flows use FTP traffics that persists throughout the duration of the simulation. The traffic generators start randomly after 25 s seconds of the simulation to avoid indeterminate behavior and lasts for 200 seconds which is sufficiently long to observe both the transient and the steady-state behaviors of the each of the AQM schemes. Each simulation was run 50 times with different seeds for the random number generator. The average packet size is 1282 bytes and the maximum buffer size of the access router is set to 130 KB which corresponds to approximately 100 packets. Table 2 shows the parameter settings for each of the AQM algorithms in the simulation. The control parameter values of the AQM schemes under evaluation are set based on the recommendation as provided by the authors of each AQM schemes. The objective is to allow a fair comparison using the setting recommended by the respective authors and also allow for a comparative evaluation using the same controller objectives. The AQM schemes control parameters are not necessarily appropriate for stability. The observed instability was significantly reduced in AQM algorithms through the use of damping and thresholding. Damping (or hysteresis) will be done by applying the control parameters of each AQM algorithms together with correct threshold values. Damping reflects a direct tradeoff between stability on the one hand and responsiveness, the system's ability to react to change circumstance on the other . The relationship between the queue length, congestion notification probability and capacity of router and the traffic parameters such as the number of flows and the RTT is defined as queue law. 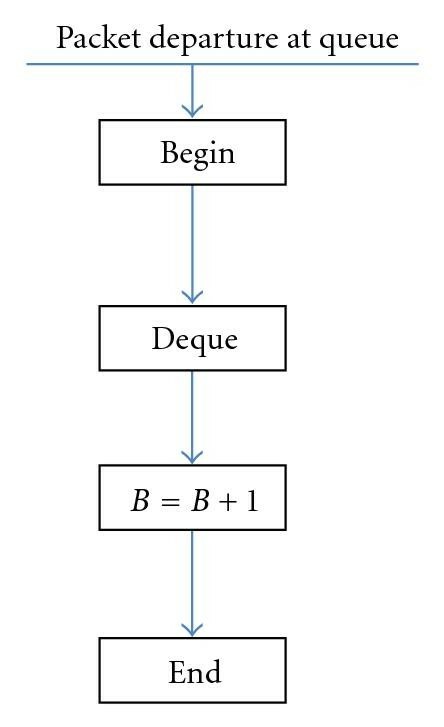 In this section we develop a simple model of buffer load with persistent congestion and apply it to mixed traffics in order to derive a general queue law. In order to achieve design goals the value of the marking/dropping function was used according to the parameter settings for each of the AQM algorithms. 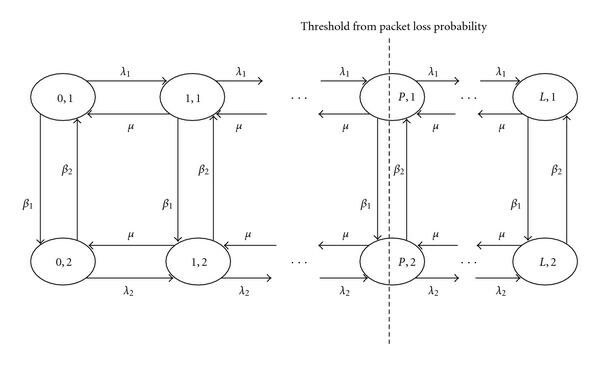 As is shown in Figure 10 by increasing the threshold (th) values, the packet loss probability decreases. In order to determine the effects of the marking/dropping function, a general range of values for the threshold (th) is considered. The th values varied from a 25% to 95% of buffer occupancy . It can be observed that 25 s after the initiation of the traffic the th was 95% of the buffer occupancy. From time 125 s the UDP flows drops for 50 s and at time 175 s the UDP flows the dropped are again added. Thus from time 175 s to time 225 s the status of traffic load will be changed to a heavy traffic load. In accordance with this, during the time interval (125 s–175 s) the value of the threshold (th) is decreased to 50% of the buffer occupancy in order to overcome the increase in the buffer size (increase as shown in Figure 13) for VQ and ARED. The variation of the threshold provides varied values for the VQ parameters and with the values of varying from 0.20 to 0.80 and for the parameter from 0.90 to 1.0. Apart from the time interval (125 s–175 s) the values for the parameters and were 0.50 and 0.90, respectively. For ARED the variation of the th values means that the parameter varied from 0.0025 to 0.0030 and the values of varied from 0.01 to 0.5. During the time interval (125 s–175 s) the value of was 0.003 and value of was 0.5. The values of the PI coefficients and were obtained from  and was chosen to be 100 packets. During the time interval (125 s–175 s) the value of the threshold (th) is decreased to 75% of buffer occupancy in order to overcome any queue size oscillation. For the AAQM during the time interval (125 s–175 s) the value of threshold (th) is maintained at a fixed values of 95% of buffer occupancy. In addition to these experiments we have conducted extensive simulations including simultaneous variations to the threshold values and the traffic load. We used heterogeneous flows and have demonstrated AAQM to regulate the queuing delays with much less variation than VQ, ARED and PI while achieving a high throughput. The result will be discussed in details in the next section. In general reducing the threshold value gives a high marking/dropping probability and the packet loss probability increases which means that the congestion control mechanism is becoming less effective and consequently these will affect the system performance metrics including both the adaptation and the mean response time. The system performance metrics including the queue length, response time and the system throughput will be evaluated as follows. We compare the performance variation using different parameters settings which are based on different values for the marking/dropping function for different flows sizes. By varying the value of the marking/dropping function it becomes possible to study system performance in terms of its queue length, response time, throughput and jitter. Figures 11, 12, 13, 14, and 15 show the results for those four performance metrics for all the AQM schemes. We summarize the performance results for each of the performance metrics separately in the following subsections. Throughput for (a) Video Traffic, (b) Multimedia Traffic, (c) TCP Traffic (long-lived), and (d) SCTP traffic. Delay for (a) Video Traffic (b) Multimedia traffic (e. g., Voip) (c) SCTP Traffic (d) TCP Traffic. Jitter for (a) Video Traffic (b) Multimedia Traffic (c) TCP traffic. Queue Monitoring with 1200 flows for (a) VQ (b) ARED (c) zooming in AAQM (d) Zooming in PI. Comparison of instantaneous Queue Size between (a) AAQM and (b) PI at time 100 s to 120 s with 1200 flows. The design goals of the AQM algorithms are responsiveness (short-term design goal) and stability (long-term design goal) in order to achieve a satisfactory control performance. The degree to which the two performance objectives are archived is measured using the queue length as a performance metric for the transient performance (i.e., speed of response to congestion). The queue should generally be kept short. The added delay from the queue also has negative influences on the congestion control algorithm which should obtain feedback that reflects the current state in the network and any time-lag. Long queues distort the RTT samples and render any RTT-based mechanism inefficient. To analyze stability (steady state) control performance, we studied the elimination of the bias of bursty sources. The term "bursty source" is here considered as a source that sends bursts of packets and none or relatively few packets in between the bursts (e.g., TCP). Maintaining a bounded queue length is very important since many applications require guarantees in term of end-to-end delay. The queue length stability assists in the avoidance of buffer overflow which is responsible for consecutive packet drop and large delays in addition to buffer emptiness which is responsible for decreasing the throughput. Figure 14 shows the queue length evolution and queue length distribution for ARED, VQ, PI and AAQM. The PI and AAQM algorithms are designed to maintain the queue length at an approximate expected value. VQ and ARED displayed the worst performance of the simulated AQM algorithms as we can be seen in Figure 14. Both VQ and ARED are sensitive to traffic load and this does not stabilize the queue length. This is due to the fact that ARED monitors the average queue length which has a direct consequence on its reactivity as can be seen in Figure 14(b). VQ adjusts the virtual queue length based on the measured arrival rate which has the effect of increasing the buffer size as can be seen from Figure 14(a). On the other hand the performance of PI and AAQM is better than that for VQ and ARED. AAQM and PI have similar queue lengths. In addition PI is less responsive than AAQM in response to buffer emptiness. As shown in Figure 15, the PI queue size oscillates between 85 and 100 packets. In contrast, AAQM regulates the queue size to 95% of the buffer occupancy. As stated above these are the two design goals of AQM algorithms. Since they are often in conflict with each other regarding the system performance, the PI schemes attempts to find a trade-off between them. The response time of PI is dependent on its control parameters  such as buffer size, desired queue length and desired stable packet mark/drop probability which is an increasing function of the number of flows and a decreasing function of round-trip time and link capacity. Under heavy congestion PI suffers from a long response time. In addition, a small buffer size PI will cause a reduction in responsiveness. As can be seen from Figures 11, 12, 13, 14, and 15. AAQM has better transient performance with a small buffer size. This is in line with the requirements for an access router (with small buffer) in order to avoid absorbing more bursty arrivals in transit traffics which has been discussed in Section 1. A design goal for AQM algorithms is in maintaining a stable packet-drop rate. In general, the bias against burst traffic and the tendency towards global synchronization can be eliminated by maintaining a stable packet loss over time. The steady-state control performance of each AQM algorithm was evaluated by studying the packet-throughput at four different traffic loads. In all experiments we have used the general control function (18) for packet marking/dropping. In terms of throughput the simulated controllers achieved good performances the exception being the ARED. This is due to the fact that the ARED dropping probability calculation depends on the previous loss ratio which makes it less sensitive to transient congestion as can be seen in Figures 11(b)–11(d). PI converges quickly to the steady state and presents less fluctuation than VQ. PI induces more queue emptiness notably in the transitory period which induces a decrease in the total throughput which can be seen in Figures 11(a)–11(d). In both ARED and VQ, when the traffic load is very light, there is minimal packet loss (high throughput) and in this case both ARED and VQ experience a longer response time. Both algorithms reaches the steady state after more than 75 s and the router buffer emptiness and throughput drop to the transient period. However, ARED, VQ and PI display fluctuation and low packet throughput over 400 flows. As a result the PI and AAQM controllers can remove the bias against bursty sources effectively. Whereas ARED and VQ may be biased against bursty sources because of multiple and bursty packet losses. Figures 11(a)–11(d) shows the average packet-throughput for each AQM algorithm under different traffic load levels. PI and AAQM show significantly higher average packet-throughput than ARED and VQ for all traffic load levels. Delay is a very important metric for real-time applications such as VoIP. Figures 12(a)–12(d) depict the delay results for RTP, UDP, SCTP and TCP from the simulations using different AQM algorithms. The PI algorithm results in the highest delay of the algorithms evaluated. This is due to the fact that PI is less responsive and this results in periods of buffer emptiness. VQ and ARED do not provide restricted delays. These schemes result in variable delays reaching very much larger values than AAQM as shown in Figures 12(a)–12(d). PI, VQ and ARED display an increase in the queuing delay with work-loads and this indicates a greater instability with regards to the responsibility of the algorithms. We note that an instability problem in the buffer responsibility will affect delay sensitive multimedia applications. We should note that the queue fluctuation inevitably causes delay and jitter. The network with the ability to provide QoS guarantees should indeed make an effort to eliminate this phenomenon. As we have discussed in a pervious section (Section 4) ARED, VQ and PI show queue fluctuations over 400 flows and this causes higher jitter which is clearly visible in Figures 13(a)–13(c). In a normal state an access router is overloaded with more than 400 flows and in the case of IPTV which is provided by different ISPs to dozens of Mobile subscribers, the number of flows during an overload time of day will be more than 800 flows. Indeed PI, ARED and VQ schemes result in jitter (variable delays) reaching very large values as shown in Figure 12. Hence, AAQM is able to give a guarantee for a restricted jitter in contrast to the other schemes. In this experiment we examine the control performance and the adaptability of AQM algorithms to sudden traffic load changes where the traffic consists of 25% of mostly Web-like short-lived traffic and 25% of ftp-like long-lived elephant flows and 50% unresponsiveness traffic load varying over time. The simulation starts with heavy traffic load consisting of 4 sources for each of the wireless network technologies at levels , 25, 50, 70, and 100 spawning flows for each of the sources with 25% elephant and 25% short-lived flows and 50% unresponsiveness flows. Thus the initial total number of flows is 120 when . From time 25 s traffic starts and from time 125 s 25% of the initial total flow drops, in other words 50% of the unresponsiveness (UDP) flow drops during 50 s so the status of traffic load changes from a heavy traffic load to a medium traffic load. Finally the 25% of total flows dropped is added again at time 175 s. Thus from time 175 s the status of the traffic load will be changed to a heavy traffic load. Figure 14 shows the queue length dynamics of the AQM algorithms under the traffic scenario. The queue length of PI remains at around and AAQM remains at around (see Figure 2), except during the time interval (125 s–175 s) because the number of unresponsiveness flows during this time interval is smaller than the lower bound 120 flows ( , then the initial total flows is 120) for PI and for AAQM. Figure 14 shows the queue length for each of the AQM algorithms. The PI and AAQM controller display a rapid response to the sudden changes of the traffic load. Hence VQ and ARED queue length grow. Those are due to the fact both schemes controller queue length are based on the measured arrival rate and queue length which has the effect of increasing buffer sizes. In this section we compare AAQM with BLUE . BLUE is a hybrid algorithm that uses packet loss and link utilization to mark a packet to avoid congestion. The drop probability is increased upon packet loss and the packet drop probability is reduced when the link becomes idle. BLUE uses both the packet loss and link utilization history to manage congestion. BLUE maintains a single probability, which it uses to mark (or drop) packets in a queue. If the queue is continually dropping packets due to buffer overflow, BLUE increases the marking probability, incrementally thus increasing the rate at which it signals congestion notification. Conversely, if the queue becomes empty or if the link is idle, BLUE reduces its marking probability, . BLUE uses two other parameters which control how quickly the marking probability changes over time. The first is freeze_time. This parameter determines the minimum time interval between two successive updates of . The other parameter used, delta, determines the amount by which is increased incrementally when the queue overflows or is decreased incrementally when the link is idle. BLUE uses fixed control parameters (freeze_time and delta) and is due to that not able to adapt the parameter settings according to changing traffic conditions. Bursty sources are used for performance evaluation with varying queue sizes managed by the AAQM and BLUE algorithms. The bursts generated require an AQM algorithm to efficiently and quickly adapt to the current situation to maintain a high overall throughput and to avoid dropping more packets than necessary. As a result the drop rate and throughput are comparable for the two algorithms. Table 3 shows the parameter settings for the BLUE algorithm in the simulation. The control parameter values of the BLUE scheme under evaluation are based on the recommendation as provided by the authors of BLUE . Control parameters for the BLUE . Figures 16(a) and 16(b) depict the results for drop rate and overall throughput, respectively. For the experiments we allowed the AQM schemes to converge to steady state when there were 400 web sessions. Then we increased the web session number to 800 and 1600 to study the performance when the number of short flows increases. The resulting curves are plotted using a 95% confidence interval. (a) Drop rate (b) Throughput. When the link capacity is low AAQM regulates the queue length best, while BLUE oscillates between an empty and full buffer. As a result BLUE shows poor performance in a wide range of traffic scenarios. BLUE should be configured with a sufficient amount of buffer space to accommodate an applied load greater than the link capacity from the time congestion is detected using the queue length trigger, until the load decreases in response to congestion notification. The AAQM controller is able to compensate for the oscillations of the flow and gives satisfactory performance with fast and stable control dynamics. AAQM shows the most robust steady-state control performance independent of traffic loads in terms of a relatively small mean value of the packet loss rate as well as its variance. From Figures 16(a) and 16(b) it can be seen that AAQM has a lower drop rate than BLUE when the number of sessions is 1600, and a higher throughput than BLUE. BLUE controls congestion reactively based on the current or past congestion information. Thus some degree of performance degradation such as multiple packet losses and link underutilization are not avoidable. In this paper we have presented a method to solve the MMPP-8 process that is utilized for the modeling of video, multimedia, web and ftp sources. We have also developed an analytical model of average packet delay and packet loss probability of AQM congestion control mechanisms for robust control on an access router for heterogeneous networks. As discussed in Sections 1 and 5 traffic burstiness and correlation have a considerable impact on network performance. The distinguishing properties of the presented model include the capturing of traffic burstiness and the generation of an expression in order to calculate the desired performance measure with regards to the queuing system. The analytical model has been used for buffer occupancy as the congestion indicator and a linear function has been adopted to control congestion by marking/dropping packets for each traffic source. The Interaction between the marking/dropping control function and the control parameters of each AQM is captured through a simple model, whose behavior is described by a set of traffics and router parameters. The model defines the relationship as a queue law and the model is applied to a system that uses packet marking/dropping for congestion notification. The queue law is used for router design of the AAQM algorithm that provides performance robustness in the presence of bursty traffic. The model verified through simulation that the design is well dimensioned for providing the property of minimizing queuing delay during maximum utilization in the heterogeneous wireless access networks.